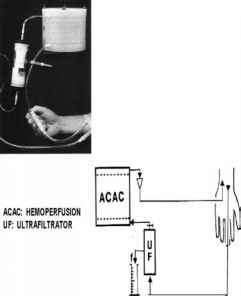 A third approach is to construct a truly miniaturized artificial kidney based on hemoperfusion in series with small ultrafiltrator (Chang etal., 1975, 1979a, 1977b, Chang, 1976c) (Fig. 10.9). In clinical studies, a small Amicon ultratiltrator was used (Fig. 10.11). Hydrostatic pressure from the blood pump alone gave effective ultrafiltration. Dialysis fluid is not required, the ultrafiltrate flowing directly into a measuring cylinder. Fig. 10.11. ACAC hemoperfusion in series with a small ultrafiltrator. and a urine volume of 50 ml/day. He was followed for a 6-month control period of thrice weekly hemodialysis treatments. This was followed by a 6-month test period when a 2.5 h hemoperfusion-ultrafiltration replaced one of the 6h three weekly hemodialysis treatments (Fig. 10.12). Fig. 10.12. Laboratory data of patient. 6-month control period followed by 6-month test period. During the 6-month test period, one of the weekly 6h hemodialysis treatment was replaced by 2.5 h of treatment using the miniaturized hemoperfusion-ultrafiltration device. creatinine clearance: 0.2ml/min;urine output: 50 ml/24 h creatinine clearance: 0.2ml/min;urine output: 50 ml/24 h a QB of 300. This was significantly higher than for hemodialysis. Nerve conduction velocity did not change. Hemoperfusion-ultrafiltration was more effective than hemodialysis in removing "middle" molecules, creatinine, uric acid, sodium chloride and water (Table 10). 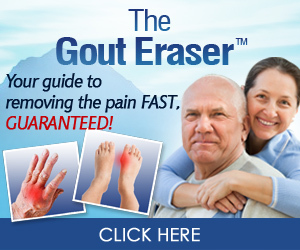 On the other hand, it did not remove sufficient potassium and urea since after 6 months on this regime, there was an increase in mean blood urea nitrogen from 86 ± 14mg/dl to 105 ± 18mg/dl and potassium from 5.2 ± 0.57mEq/l to 5.8 ± 0.08mEq/l. Oral adsorbents can remove potassium and phosphate. An urea removal system is being developed to complete this miniaturized artificial kidney system. For this, artificial cells containing multi-enzyme systems and artificial cells containing urea removing microorganisms are being investigated.